Heading to a park in Anchorage, Alaska on a wintery afternoon last March, we’d expected to find a ghost town of forgotten, weather-battered play structures, neglected running paths and desolate parking lots. Instead we found Margaret Eagan Sullivan Park teeming with parents and their bundled-up toddlers vying for spots on the oversized swing; a steady string of shorts-clad runners and fat-bikers (and their dogs) traversing the scenic 11-mile Tony Knowles Coastal Trail; and a cluster of ice skaters and hockey players on the frozen-solid Westchester Lagoon, all clamoring for the last bits of daylight despite the 35-degree chill. 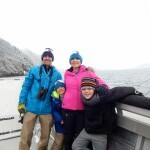 While bears may hibernate in winter, Alaskans do not, a fact made clear during my family’s March rendezvous with Alaska’s family-travel guru, Erin Kirkland. 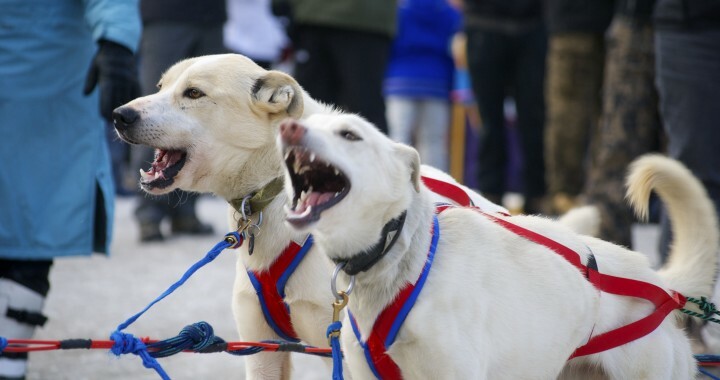 A boat ride, skiing adventure and other kid-friendly destinations—there were plenty of activities to fully exhaust us by the time we reached the trip’s pinnacle, the ceremonial start of the Iditarod Sled Dog Race. 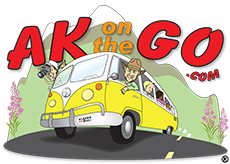 If you, too, have considered an Alaska trip that includes front-row views of the “Last Great Race on Earth,” read on for a whirlwind of wintertime family-fun ideas in Anchorage and beyond. 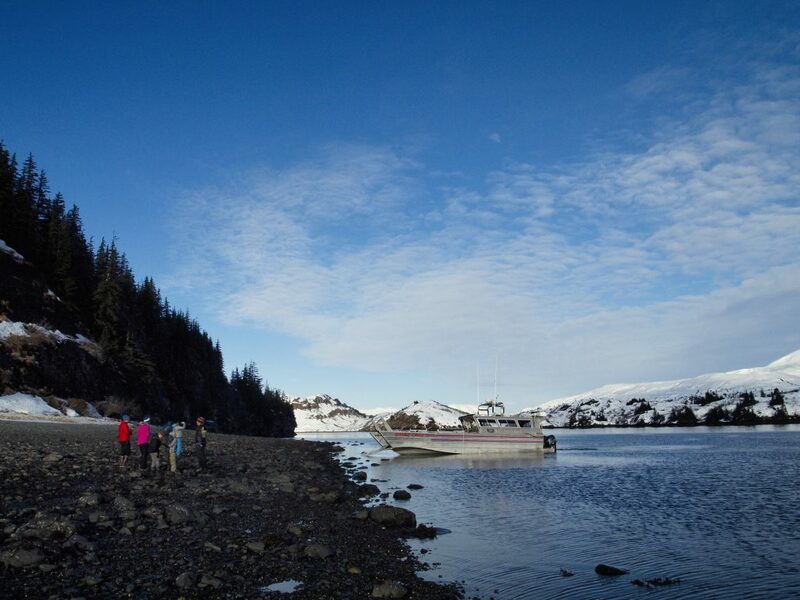 The last time I’d been on a one-day boat tour in Alaska, I was miserable. And by miserable, I mean vomiting. But some 15 years later, memories of that unusually tumultuous whale-watching journey through Kenai Fjords have all but vanished after a tranquil voyage through Prince William Sound via Lazy Otter Charters. 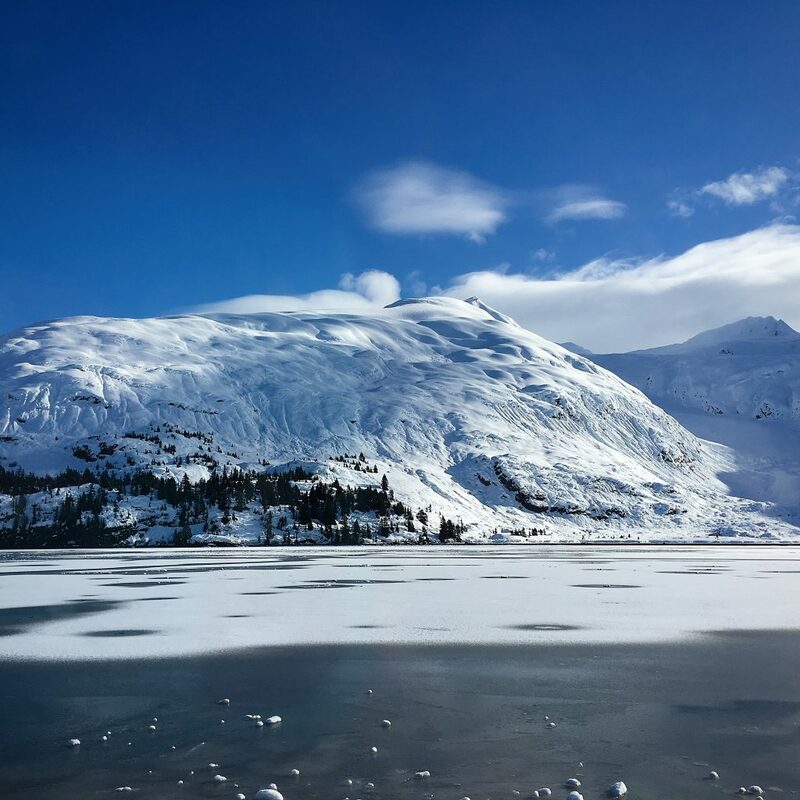 Based in Whittier, Alaska—one of a handful of port towns in the area and a popular day-cruise destination about an hour from Anchorage—this off-season, half-day trip is a chance to experience its untouched coastal wilderness in relative solitude. It’s true that the only other boat we passed was, indeed, a ferry, allowing our boat, Qayaq Chief, to travel alone toward Blackstone Bay. Plying its still waters, we spotted sea otters floating amid the icebergs, which cracked and banged against the hull as we advanced toward Blackstone and Beloit Glaciers. Two among the plethora of Prince William Sound’s tidewater glaciers—valley glaciers that flow into the ocean—the area boasts the world’s densest concentration of them. In other words, if you hope to see chunks of ice calving from these jagged, wintergreen-blue behemoths, this is the place to visit. Of course, the glaciers didn’t perform for us that day. But the blue skies and abnormally spring-like temperatures made up for it, offering a pleasant stop on the rocky beach to explore some tide pools. My kids were all too happy to join the boat’s biologist, Leah, in her search for resident life forms. Ambling along the uneven terrain, they gently overturned a few hefty, charcoal-colored rocks to investigate what lay beneath. “Mom! Look!” My oldest yelled for me as the three “scientists” crouched around a small pool of gunnels—fish resembling tiny, brownish eels squirming amid the lavender-hued mussels—their hands smeared with mud. “I love when I have kids on my tours,” Leah smiled. It wasn’t exactly the exciting, whale-watching trip my husband and I experienced in 2001. But I’ll choose smooth sailing over high-sea spewing any day. And did you know? About 60 miles southeast of Anchorage, the town of Whittier was established in WWII as a strategic military port. Home to some 200 residents, most of whom live in former Army barracks Begich Towers, more than 700,000 visit Whittier Harbor annually. If you go by car, you’ll drive through Anton Anderson Memorial Tunnel, a one-way passageway shared by car and train, and the longest railroad-highway tunnel in North America (2.5 miles). Growing up in Colorado near some of the best ski resorts in the world—including Vail, Winter Park and Copper Mountain—I’ve never been inclined to travel out of my state for a ski vacation. That is, until our wintertime visit to Anchorage, which just happens to be 40 miles away from Alaska’s largest ski area, Alyeska Resort. Located along the world-renowned Seward Highway and tucked against the base of the Chugach Mountains, this Girdwood resort is legendary for its extreme terrain and average annual snowfall: 650 inches, nearly 30 percent more than Colorado’s top spot, Wolf Creek Ski Area (465 inches). And while its 1,610 acres of skiable terrain means it’s about half the size as many of my favorite ski areas back home, Alyeska’s view is literally second to none, boasting the only ocean view of any North American ski resort. 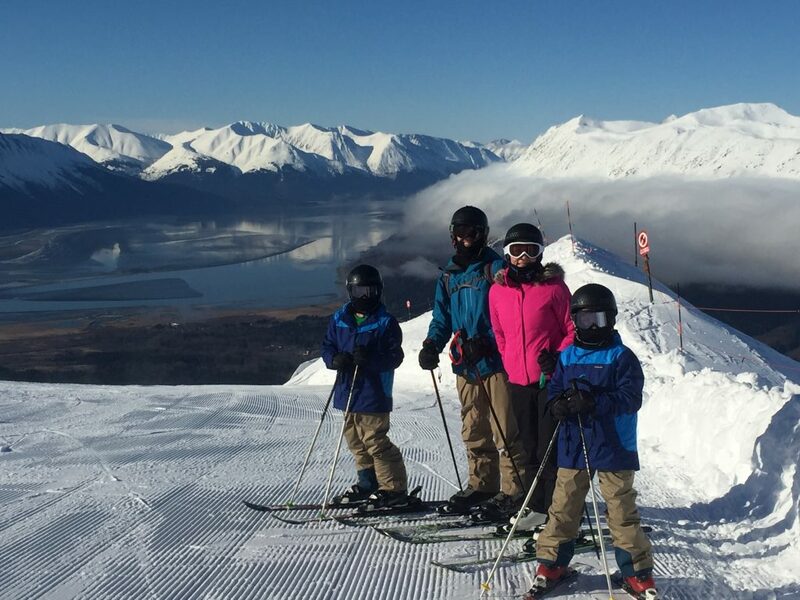 “Alyeska Resort truly does have something for everyone,” says Shannon Markley, the resort’s marketing engagement specialist who skied part of the day with my family. Offering everything from beginner trails to advanced runs and expert terrain, she says, Alyeska is a great place for anyone who wants to learn or for those who want to put their expert skills to the test. “Even if you are not a skier or snowboarder, taking the Tram up 2,500 feet and standing at the top of the mountain to see hanging glaciers sandwiched between huge mountain peaks with the ocean in the background is just…indescribable,” Markley says. Did you know? Alyeska Resort boasts North America’s longest continuous double-black diamond run, The North Face, and is the only ski resort on the continent that offers mountain, glacier and ocean views. And once spring hits, the resort receives more sunlight per day than any other North American ski resort, allowing night skiing from 4 p.m.-9 p.m. (Thursday-Saturday January through March.). For a true luxury mountain experience, stay at the Hotel Alyeska, a 304-room property featuring on-site amenities, from dining to shops, The Spa at Alyeska, saltwater pool, whirlpool and fitness center. In addition to alpine skiing, winter activities include Nordic skiing, snowshoeing and dog sledding, as well as heli-skiing and cat-skiing operations. The Resort’s summer season offers hiking and biking, flightseeing adventures, glacier dog sledding and ice climbing. A Colorado-based company that ships gear to your destination so you don’t have to transport it yourself, I appreciated GetOutfitted for our Iditarod adventure. The company was founded on renting ski clothing and equipment, a perfect solution for our first skiing trip outside of Colorado. So instead of packing all of our bulky clothing—coats, snow pants, gloves and goggles—GetOutfitted shipped four ski outfits to Alaska. Not only was the service convenient, but it was also fun to wear new coats and pants that, frankly, I didn’t want to ship back to the company. The hot-pink Obermeyer coat with faux-fur-trimmed hood would be a splurge for me to purchase, so renting was a great way to feel extra stylish—if only for a few days. On our whirlwind, four-day trip, we only had one full day to tour Anchorage. And as Alaska’s largest city—around 300,000, roughly 41 percent of the state’s population—there’s no shortage of family-friendly offerings. The Alaska Zoo—Opening in 1969 as the Alaska Children’s Zoo, its genesis began in 1966, when an Anchorage grocer won a contest. The prize? A 2-year-old, female Asian elephant named Annabelle. As the community’s interest in her grew, so did the idea for a zoo. 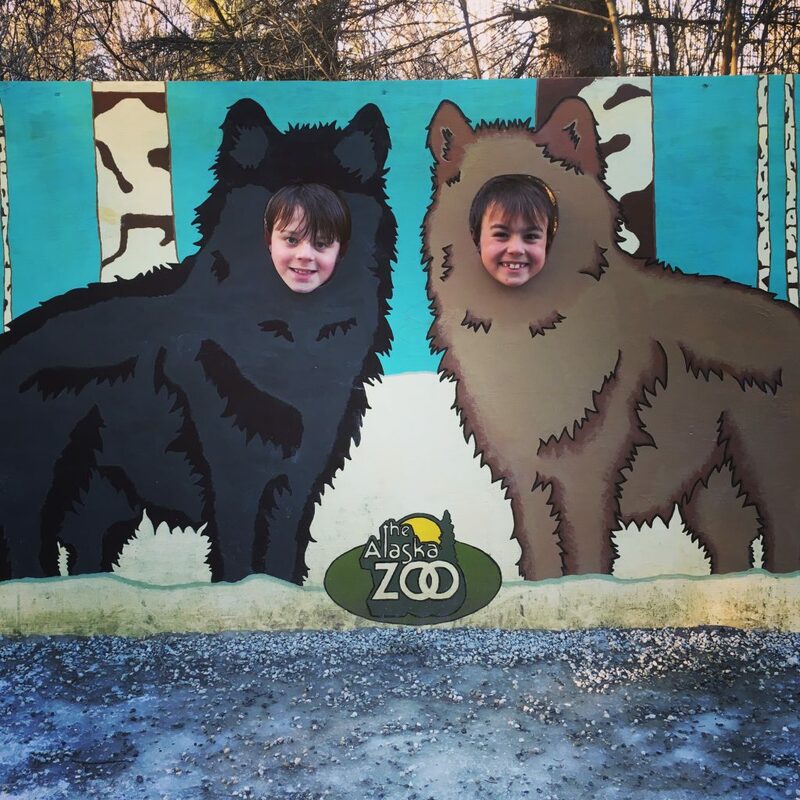 Some 50 years later and renamed The Alaska Zoo in 1980, it’s located on 20 wooded acres and is the only North American zoo specializing in northern animals. From Native species like moose, wolverine (the first one I’ve ever seen in real life) and caribou, this zoo features all four Alaskan bear species: brown, black, glacier and polar. But my family will most fondly recall watching the zoo’s ducks take turns sliding down an icy, duck-sized hill. 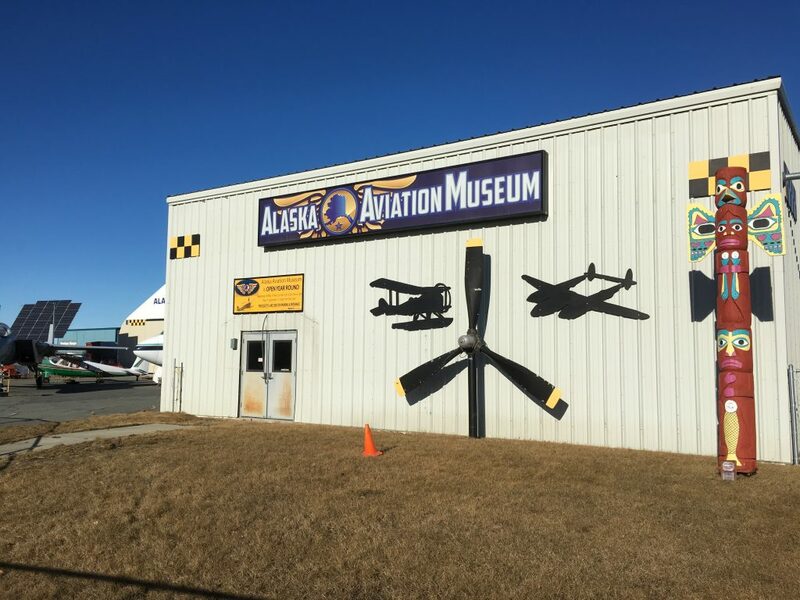 Alaska Air Museum—Located along the shore of the world’s busiest floatplane lake, Lake Hood, this museum is a nod to the bush pilots who’ve braved Alaska’s treacherous terrain for more than 100 years. It also showcases the state’s military significance and the history of Alaska Airlines—as well as Pan Am Airlines, which pioneered commercial flights to the state—and 25 restored vintage planes. Kids will especially love playing in the museum’s flight simulator then heading to the observation deck to watch planes take off from the lake. Where to eat. I wasn’t surprised to find sophisticated food in Anchorage; I just didn’t expect to find it at practically every meal. Favorites included breakfast at Middle Way Café, which uses organic, locally sourced ingredients in meals like my Eggs Florentine, just like so many of my favorite Colorado eateries. And its new sister restaurant by the same owners (located next door), Hearth wood-fired pizza is as stylish and hip as any Denver-area restaurant. Plus the food is delish. Another favorite? The Indian food at Namaste Shangri-La, located in a nondescript strip mall, was so good, we’d fly back to Anchorage just to taste their naan once again. Where to sleep. We preferred to stay near downtown for easier access to the Iditarod start but also wanted room to spread out all that winter gear. So the perfect compromise was renting a home from VRBO.com (Vacation Rental By Owner). An updated, three-bedroom charmer, it was beautifully decorated and comfortable. 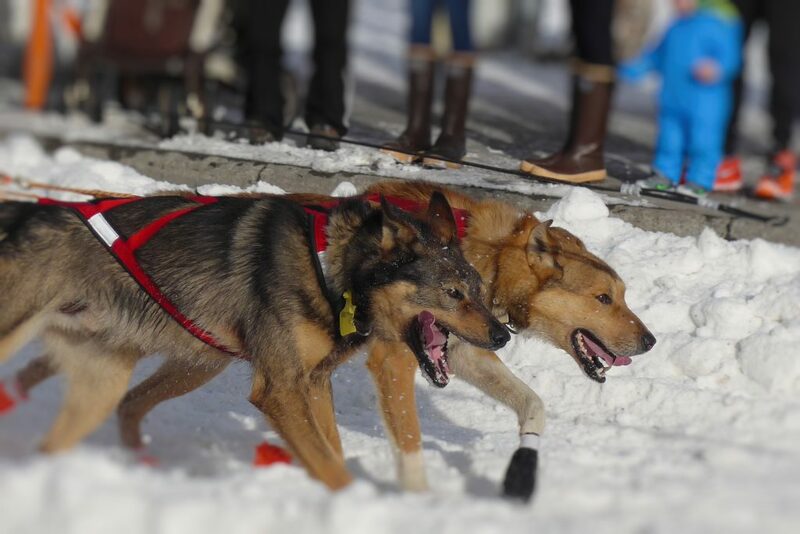 The house was also about a block from part of the Iditarod’s ceremonial route, allowing convenient viewing of dog teams as they headed toward the finish. Bonus? Some strangely quiet but delightful chickens lived in the property’s shared backyard, which captivated my boys. 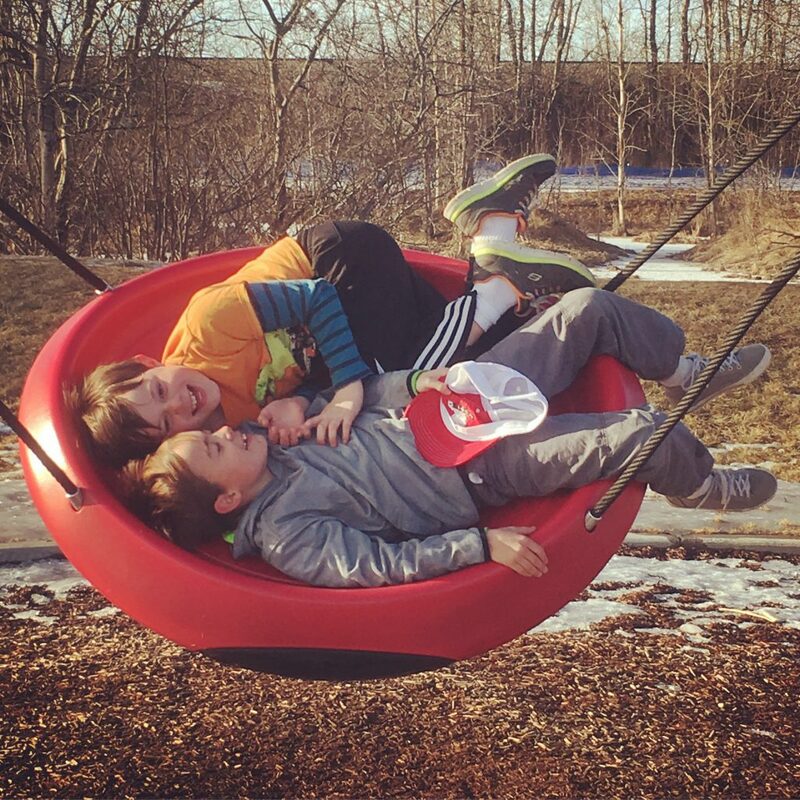 Heather Mundt writes the blog Momfari, and lives in Longmont, Colorado with her family. Posted in Alaskan Winter Fun, Big Adventures and tagged Alaska, Alaska Travel, Alaska Zoo, Anchorage, Family Travel, Iditarod, Lazy Otter Charters, mushing, Sled Dogs, Winter.